In addition, Israeli businesses, citizens, and government actors are responsible for significant environmental pollution that has caused severe health impacts and loss of livelihood for thousands of Palestinians. Local data show elevated incidents of serious health problems, such as cancer, in areas subjected to serious air pollution, toxic waste, and the like. 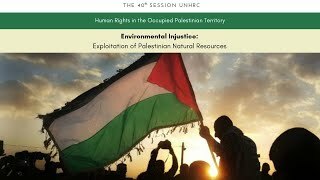 The continued presence of these pollutants causes cumulative effects leading to long-lasting environmental damage and long-term health problems for current and future generations of Palestinians. This event explores the nature of the issue and the prospects of addressing the problem at the international level. Ms. Daniela joined GICJ in January 2013. She holds a Master in specialized translation from the University of Geneva. She has undertaken visits to several countries in Middle East and Pakistan,where she was exposed to different culture and ways of life. She is passionate about intercultural dialogue and committed to the rights of minorities. As an officer in the reporting section of GICJ, she is closely in touch with people on the ground and prepares updates for the OHCHR on cases of concern. International Organization for the Elimination of All Forms of Racial Discrimination (EAFORD), International_Lawyers.Org, Geneva International Centre for Justice (GICJ), Union of Arab Jurists (UAJ),International Educational Development, Inc., World Peace Council, The Brussells Tribuna.